I have to admit this is my favorite time of year. There's nothing better than the time between Thanksgiving and Christmas. Parades, parties and getting together with family. One thing I always look forward to is putting up the holiday decorations. It's even more special now that I have kids. September through the end of the year is the busiest time at Carrington Court. Everyone's ordering new furniture in time for the inevitable get-togethers that happen in November and December. It is essentially a part of the holiday decorating process. Let's face it--these holidays are focused around eating, so your dining room will be the one place that receives the most attention from family and friends. We put a lot of thought into ways that we could make your dining experience more festive and we came up with a line of holiday specific slipcovers. Slipcovers turn out to be a very good fit (no pun intended) for this time of year. First of all, they allow you to give your dining room a more festive look without being stuck with it year round. You put them on in November and take them off in January. Slipcovers also offer protection to the chairs underneath. Cranberries and gravy tend to be less ominous when in the worst case scenario you end up replacing a slipcover rather than an entire chair. Finally, slipcovers are an option for those who purchased chairs in the past that are still perfectly good but would like to change up the look. This Christmas we are offering two very similar styles with one major difference. 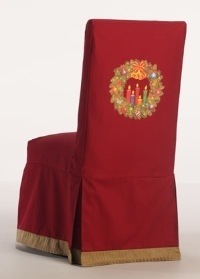 Both slipcovers have a simple, pleated skirt and are offered in a festive red fabric with gold accents. The only difference: the Noel Slipcover features a screen printed wreath on the back and the Nicholas Slipcover does not. These slipcovers are available for most side chairs in our line. We are excited about offering something especially for the holidays. In the future we are considering adding more seasonal pieces throughout the year, so keep an eye on this space for more announcements. As always, if you have any questions about purchasing slipcovers, feel free to call us (828.396.1049) or send email to info@carringtoncourtdirect.com.